Currently studying toward a conjoint Bachelor of Arts/Bachelor of Laws. Born and raised in Rotorua, I come from a large family of 11 and am the first in my family to study at university. 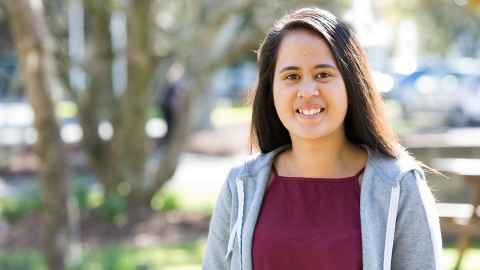 I chose to study a Bachelor of Arts and Laws at the University of Auckland so I could use my legal knowledge and skills to give back to my whānau, marae and iwi. UTAS has helped me to not only pursue my studies but also to access workshops and learning centres for Māori, facilitated by Māori. It is through UTAS that I am able to achieve my academic goals. I am also a member of Te Rākau Ture, the Māori Law Students Association, and Ngā Tauira Māori, the Māori Students Association. Being part of these groups has helped me feel connected to my whānau and marae. They are like a home away from home while living in Auckland. As a 3rd year undergraduate and the first in my family to attend university, I have been awarded various grants and scholarships from my marae, hapu and iwi. As a way reciprocating this generosity, I help out whenever I am needed at my marae and whānau trust. When I graduate I aspire to become a Māori Land Court Judge. Currently studying towards a Bachelor of Human Services. Facing the challenges of living with cerebral palsy is one of the main reasons I chose to study human services at the University of Auckland. I have learned to manage the frustration of not always being able to do the things I want to, and recognising that some people find my speech impairment a barrier to connecting with me. I know that many other people with disabilities face similar or more complex struggles than I do. One of my core beliefs is that we all have one opportunity at living life. Before enrolling at the University of Auckland I studied Christian theology at Bible College for two years. During my second year at the college, I realised I wanted to advocate for people with disabilities. Thus began my journey into selecting the Bachelor of Human Services*. As I made contact with various institutions about their programmes, I described my cerebral palsy as well as my goals and aspirations. I was very impressed by the University of Auckland’s response, which suggested I enrol in the Bachelor of Human Services programme. I discovered that human services, which offers a major in disability, was the ideal programme for me. As a UTAS student, I received support from Student Disability Services to make my experience at university easier, like having a note-taker in my lectures. I have done a DELNA test and a targeted learning session, which have helped improve how I study and write assignments. *The Bachelor of Human Services will not be offered for new students in 2016/17. Prospective students interested in this area of study can consider applying for the Bachelor of Social Work.